Holocaust movies are often shown as heartbreaking stories of oppressed Jews versus ruthless Nazis. These may be the polarized extremes of World War II, but German families, neither fighting the war nor suffering in camps, lived in constant fear, poverty and eventually, a deadly war zone. “The Book Thief,” directed by Brian Percival, is about a pre-teen girl who avoids Nazi culture, finds her voice and faces the harshest reality of life: death itself. It’s the classic coming-of-age tale in the cruelest of circumstances. Sophie Nélisse stars as Liesel, a 12-year-old put into foster care when her mother is punished for being a communist. She is welcomed into the modest home of Hans and Rosa Hubermann, played by Geoffrey Rush and Emily Watson. Although initially bullied for her illiteracy, reading and writing eventually shape the events of Liesel’s childhood, which occurs in a time of book burning and censorship in Nazi Germany. The talented cast, music by John Williams and an authentic backdrop bring the story of Markus Zusak’s novel to life. Nélisse gives an impressively mature performance, but Watson and Rush are the true standouts, able to evoke complexity in characters that could easily become caricatures. Nico Liersch embodies childhood naivety in the role of Rudy, Liesel’s best friend, and Ben Schnetzer is captivating in his unfortunately few moments as Max, a Jewish refugee living with the Hubermanns. The most powerful scenes occur when this Nazi-defying family comes face to face with their society’s expectations. The effects of Nazi brainwashing are felt when Liesel and Rudy must watch books burn and sing the national anthem, and these effects grow stronger as full-scale war draws nearer. The final scenes, however, feel rushed and choppy with a strange narration by Death personified. As with the story’s theme itself, words, rather than events or scenery, are the most moving. “I want to grow up before I die” is one especially heartbreaking line from Rudy. Thankfully, it’s not a two-hour long sob-fest. Rudy’s romantic pursuit of Liesel and the Hubermann husband and wife banter provide genuine laughs. Tackling events the size and importance of the Holocaust is no easy task, but “The Book Thief” is successful, portraying the impact of the war on both large and small scales. The expectations of Nazi culture are pervasive, and when they invade the lives of the characters we care about, the film becomes a moving experience. The filmmakers also made editing choices in adapting the original novel, which may upset fans of the book, but the film itself feels complete. Including every minor detail would detract from the hope, despair, love and friendship at the heart of the story. “The Book Thief” is a fresh perspective on the event that has compelled and horrified us for decades. 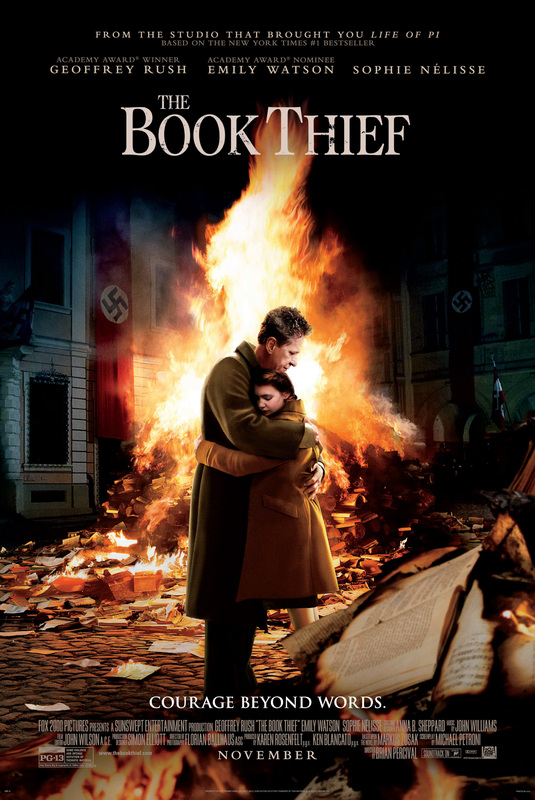 The film is suitable for viewers as young as the main characters with a PG-13 rating but ultimately “The Book Thief” balances the heaviness of the era with the lightness of adolescence.